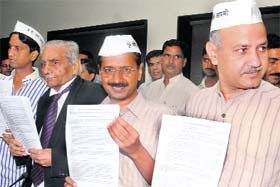 Indian Against Corruption (IAC) member Arvind Kejriwal today sought to red-flag a land deal that allegedly favoured Robert Vadra and DLF in Gurgaon and demanded the Haryana Government publish a white paper on all land released by the state government to the realty major. 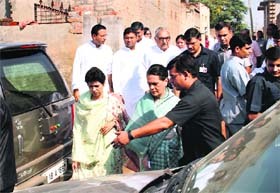 Congress president Sonia Gandhi today offered condolences and a hug to the family of a teenage girl who killed herself in Jind after she was allegedly gang-raped. The Congress chief pitched for �stringent action� against the perpetrators of the �horrific� crime, but rejected the khaps� demand to reduce the marriageable age of girls to 16. 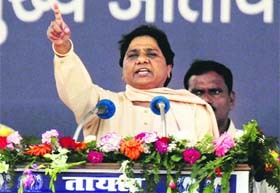 Attacking the UPA government for its "anti-people" decisions, BSP supremo Mayawati today said her party would take a final call tomorrow on whether to continue its outside support to the Centre. Even as the customs authorities are tight-lipped about any breakthrough in yesterday�s seizure of 105 kg heroin in rail cargo from Pakistan, it has come to light that the goods train from which the seizure was made took around four hours to traverse the 25-km distance between Attari and Amritsar. The Supreme Court today permitted the Centre to notify within a week its fresh guidelines for tiger conservation and regulating tiger tourism.